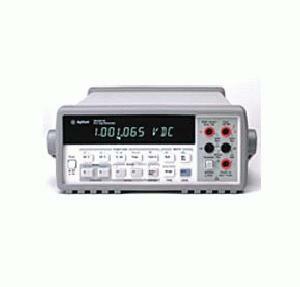 The Agilent 34401A multimeter is a tool kit of useful testing functions. In addition to the standard functions you´ve come to expect from a high quality DMM, you also get many other capabilities, from min/max/avg to built-in limit testing. 6.5 digit precision measurements for an affordable price means you can make measurements with confidence without breaking your budget. IntuiLink, free PC connectivity software for many of the Agilent leading instrument families, provides direct access from your PC applications to the instruments that set up and take measurements. IntuiLink lets you spend less time struggling with instrument data, and more time using it, analyzing it, putting it to work. The IntuiLink PC Application toolbar allows you to easily transfer measurement data and images into your familiar PC applications like Microsoft Office Excel and Word, with little or no programming. The ActiveX control feature allows you to control instruments from your PC, providing built-in routines for simple test system automation that streamline repetitive or complex tasks. Integration between instruments and key PC applications has never been tighter.